Today is the day I submitted my inspiration pieces to my partner for the Spark 29 challenge that Amy Souza hosts. Both my partner Alyscia Cunningham and I have decided to participate as Artist and Writer. So early this morning she sent me a photograph and an excerpt from a written piece so that in the next ten days I could respond to each. When I saw the photograph, a phrase came immediately to mind and I began the poem just as soon as I zipped my two files off to her - one poem and a photo. On June 5 we will reveal to each other what we have produced from our inspiration pieces. Now for the hard part. The art. I know I can take a picture pretty easily for this one. Well, I think I can anyway. But I was thinking I might want to do a watercolor instead. I have not done much watercolor lately. I need to do that. Then again - maybe it should be something else entirely. Not sure what. I will let that stew a bit longer. I have to take care not to trip. Their story, and end with a quip. Not a great poem, but one nonetheless... and it didn't take a long time to write. That is the plus. That is the poem's finer quality. I will write something good some other day when I don't have a million things to do. I was going to say bazillion, but I don't have THAT many things to do! No one does. Here it is! My husband and son went to look at it last night and bought it. It has lots of extras and is very loud! And shiny. It is a well kept bike, and we are the proud new owners of a 2004 Harley Davidson 1200 Custom Sportster, pearl white. Here's my husband on the bike for the trip home. If you look closely you can see his beard peeking out from under the helmet... no, that is not a white shirt! Now I need to get a helmet. The bike needs a change of seat so I can join him on rides, and I need a new jacket. Discovered the ones we have, although they fit, are just a bit too heavy for my back just yet. We also need some bags for souvenirs and snacks, and a windshield to keep the bugs out of our teeth and the wind from freezing us solid on the cool evenings. I'll get a picture of me when I'm all ready to roll! Before we're put out to graze! HA! I knew there'd be a poem in it somewhere. Here's the thing. I have now finally officially lost 35 pounds. I am continuing to lose weight slowly but surely. I finally weigh less than my husband, which is like SO exciting! I am boldly starting more physical therapy to further strengthen my core and lower back. I can now easily walk a mile - fairly briskly and not get winded or have to stop and stretch my back muscles. And here is a secret that is even more exciting: I can now fit into my old leather motorcycle jacket! You didn't think I owned one, did you? 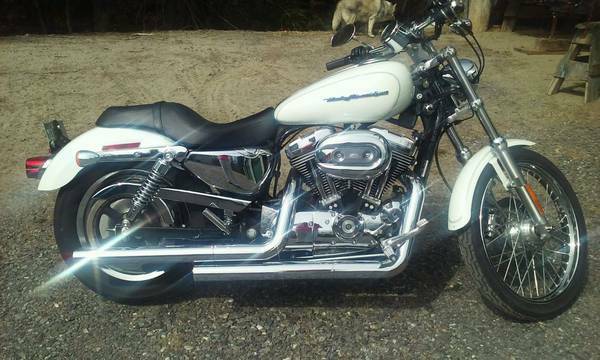 So, BOLDLY, we are looking at a "new" used Harley on Monday! We are going "on the road again"! 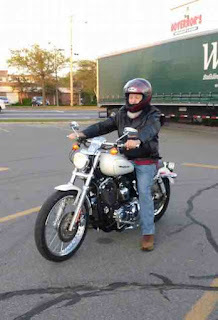 My husband has always wanted a Harley Davidson, and this will be a dream-come-true for him. Feeling this good has also been a "dream-come-true" for me! We'll need new helmets. Ours have long ago dried out, I'm sure. It's been a LONG time since we rode and helmets should be replaced periodically to be safest. We will also get a new headset, so we can talk to each other as we cruise along the back roads. Yes, I hear you. Of course, we will be careful! We always have been. I know that isn't always the issue with riding a motorcycle. There are always deer, dogs and drivers who aren't watching out for your best interests. But that's how life always is. I'm always a passenger on our treks, but I still love the openness, the smells and sights from the motorcycle. Stopping to smell the roses is done best on a bike. We have mostly toured Nova Scotia by motorcycle where we own a piece of bold oceanfront property. I would like to take the ferry up and see the land and all of the Province again. I would like to tour the state and maybe some adjacent states. And this is what I like about riding. You smell the deliciousness of new mown hay, of flowers, and of ocean before you see them; and the delicious, delightful smells remain helmet-bound even when the vision has passed. I have an awesome poem by a student to share with you today. I signed up to receive a postcard from Jone MacCulloch‘s Silver Star Poetry Project this spring, and my postcard with it's illustrated poem arrived just over a week ago. 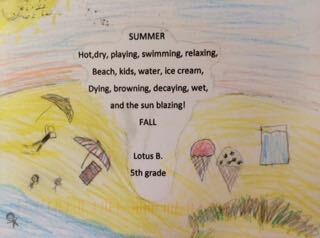 It is by Lotus B. in fifth grade. Wait... I think I see me lounging on the beach right there under that big beach umbrella! This project is such a lot of fun for the recipients of these poems, and I have a feeling, just reading and looking at the postcards posted on blogs so far, that the students are enjoying this sharing, too! I've got my tank tops. To awake the wind chime. I'll be out pulling weeds. To each take a turn. Of cold things to drink. Could we just skip summer? There's sweat on my brow. PS: I'm not a fan of hot weather. Can you tell? Happy Poetry Friday, all! Now go visit the other poet lovers. They may be found at Reflections on the Teche where Margaret Simon is hosting this week. - If there is nothing on this page yet, check back later after I have realized that I have posted no poem and nothing of interest. It is a scheduled page. I should write this more often on my scheduled pages, as I have uploaded half finished work before and realized it too late. Nevermind. I started writing as soon as I wrote the above disclaimer. This was going to be a short, nothing poem that I started... and now it has grown longer, and it is fine to use today after all. I'm keeping it for Poetry Friday. I did start out with a toad - it rhymes so well with road. But the ending then made it necessary for me to change to a frog. Toads don't eat leaches. But frogs do. I was successful in not rhyming anything with "frog"! For that, you will probably be grateful! I was. Across a road quite wide. The waves just out of reach. But it was icy cold! So much for being bold! Not 'beach-combing' in the sand." Of when he was a tad. Join others for Poetry Friday at Violet Nesdoly's! You won't regret it! It's warmer than the ocean and you'll be braver than a frog. 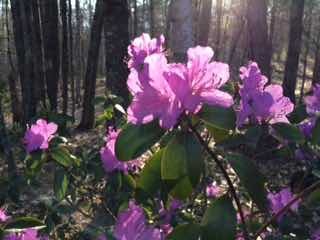 I promised to feature some pictures of my backyard, neglected azalea yesterday. Here she is! You can see the pot it is still in, and how it leans to grab some sun. It looked delighted that I took pictures of her. So though she is not in my front yard where she rightly belongs (she doesn't realize that still we, and the UPS and FedEx guys are the only ones to see who would see her in the front yard anyway, as we aren't exactly on a heavily traveled road...), I actually can see her all day every day, all seasons, from where I sit to write. So in fact, she gets much more viewing time than she would in the front yard! She has been one of the most delightful surprises I've ever been gifted. To put on her glow. For each fresh morning dew. I did not post on Monday, and if I don't post today, then I run the very good risk of not making my bold goal of 1000 posts by December 31. So even though this is late today, I am posting. Buoyed by green capped waves. 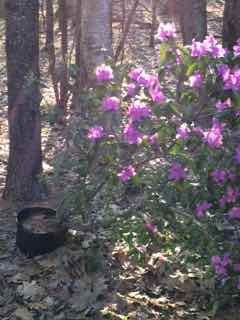 Our "discarded and ignored" azalea bush in the backyard, is blossoming again...lots and lots of blossoms. 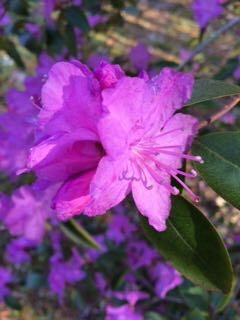 Years ago, we had meant to plant it in the front yard, but time got away from us that summer and we set it, pot and all in the back yard on the edge of the woods. Even though the pot was exposed all that winter, the plant stayed alive. We determined that it would be planted that spring. It wasn't. It didn't blossom and we kind of forgot about it. About three years later, it was STILL alive, and it produced one blossom. We determined to plant it. We didn't. The root system was through the little holes in the bottom of the pot, and we were afraid we'd break them and kill it. After that year, it started blooming every spring. And every spring we think about how we should try to move it. But it has SO many flowers now and seems SO happy where it is. No matter the winter we have, it doesn't freeze the roots somehow. We could not have been more neglectful of this hardy bush. I love it. Tomorrow I will take a picture of it and post it. It was small when we bought it, and it hasn't really grown by leaps and bounds (I wonder why? ), but it has grown some and definitely is a beautiful plant. It deserves the front yard! But I do not want to kill it or set it back any more than we have. Maybe I will get it some dirt and surround the base, slitting the black plastic pot it is in...maybe it already is breaking on its own. I'll look tomorrow. I can at least give it a little help. I love gardens and plants, and know the names of many wild plants. My husband was raised on a farm, so we know our potatoes. But we are just not gardeners. Plants in our care have to be self-sufficient, self-motivated, self-starters - independent sorts. I have the utmost respect for those out there who enjoy gardening and have thriving plants surrounding them, and I would like to be in that group. But I'm not. Today is post 800! And it is Poetry Friday! Sylvia has the links at Poetry for Children. with Wednesday's and Thursday's stanzas 1 and 2. Maybe I'm finished? And may grace to all be given. As with joy I dwell within it. May I wisely see it's heeded. I may have one more stanza tomorrow for Post 801, but I May B done. Either way, I'll take Sunday off. I'm totally going to make 1000 posts by the end of the year. A side note: I announced on March 9 that I'd lost 23 pounds. Today, I hit 33 pounds gone. I may just hit my mark by year's end, or close to it. Happy Poetry! Happy Friday! Happy May! It's post 799 and the second stanza of my May poem. Happy Cinco de Mayo! Cinco De Mayo is celebrated to commemorate the Mexican Army's victory over French forces at the Battle of Puebla on May 5, 1862. 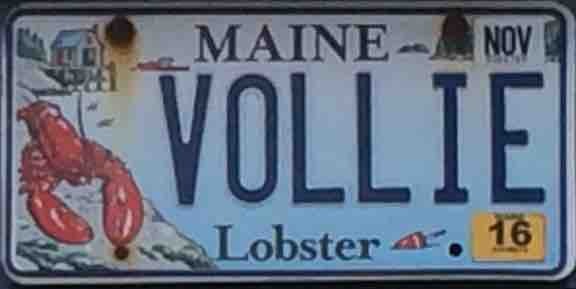 If you are looking for something to do to celebrate this in Maine.... Well, here you go! 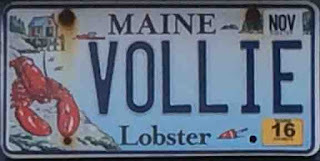 There are, however, a great number of people of French descent in Maine, so in some respects I would be surprised to find many celebrations here. Like most celebrations nowadays though, it seems that we just want to celebrate regardless of the meaning or origin. I will hit 800 posts probably on Friday! It's exciting. I'm aiming for 1000 by the last day of the year. Is that even possible? How many days into 2016 are we anyway? Do I have 200 days left to do this? Let me check. Okay, Siri says, "There are 241 days until then." So, yes, in theory and days I have enough time. That will mean I can take off 34 Sundays and miss a couple more days and still make it. My other goal is to be moved into Gull Haven in Friendship by the end of the year. And while I'm at it, I may as well be going for achieving my weight goal. It is going to be a busy year. I think I will start a poem here and finish over the next two or three days. Don't know when it will end. Then when it does, maybe I'll start another one that is also in daily stanza doses. It will make for an interesting way to build a poem - kind of a progressive poem, only by stanza? I'll try it anyway. Nothing to lose, maybe - except sleep and weight. Today is the third day of May, three days past the end of the A to Z Challenge. It is difficult just stopping, but it is also good to have a change of pace for a bit. I made it through the month of April, posting a poem a day with vanity plates as my theme for A to Z. I was sick for two weeks, and it made it difficult to post some days, but I got it done. However, it meant that I didn't get to visit other sites as much as I would have liked. I'm going to try to make up for it this month. So my posting may be lower, but my visiting will be higher. I am feeling much better now. I have also been visiting my daughter and her family, and been away from home for a few extra days without my computer. I'm working on either my iPhone or my iPad to post. And unfortunately, when I am in edit mode, it doesn't like to scroll down to the bottom of a page easily, so the past few days haven't been the easiest of blogging days. May 3. It's the day before my daughter's birthday - a day between two false alarms and her actual birth. No false alarm that day, but the doctor wanted me to stay the day before (May2). He'd decided I'd be induced, since it was my second trip into the hospital. I refused, and went home. So she could have been born on May 2 and would have been a day old on May 3. Instead she was born on May 4. Every beginning of May I think about how hectic and strange those first few days of May were back 33 years ago - how she was almost born on the 1st and then the 2nd, but held out until the 4th, to be born naturally with my regular midwife (not the one on duty), in the same room with the brass bed with yellow rose covered sheets as her brother had been born in two years earlier. I've had a good stay, and today we head home again. We celebrated her birthday early - on May 1 - one of the days she could have been born, but decided against. Finally the A to Z Challenge has concluded! NaPoWriMo is finished! National Poetry Month is over! It is May! But before saying good-bye to April, I want to thank those who not only read my Poems on Plates this month but wrote poems, too! Brenda Harsham not wrote on her website, but also wrote to a plate each day in April, right along with me! So awesome! And Violet Nesdoly used a selection of the plates to create a found poem. move over, I need room!